The DVD set includes the previously released 2008 Christmas Special, “The Next Doctor”, The “Easter Special” “Planet Of The Dead”, “The Waters Of Mars”, and the two-part “The End Of Time”, which concludes David Tennant’s run as the 10th Doctor, each on its own DVD along with the corresponding Confidential specials and a few more extras. First, some of the technical details of the DVDs and packaging. 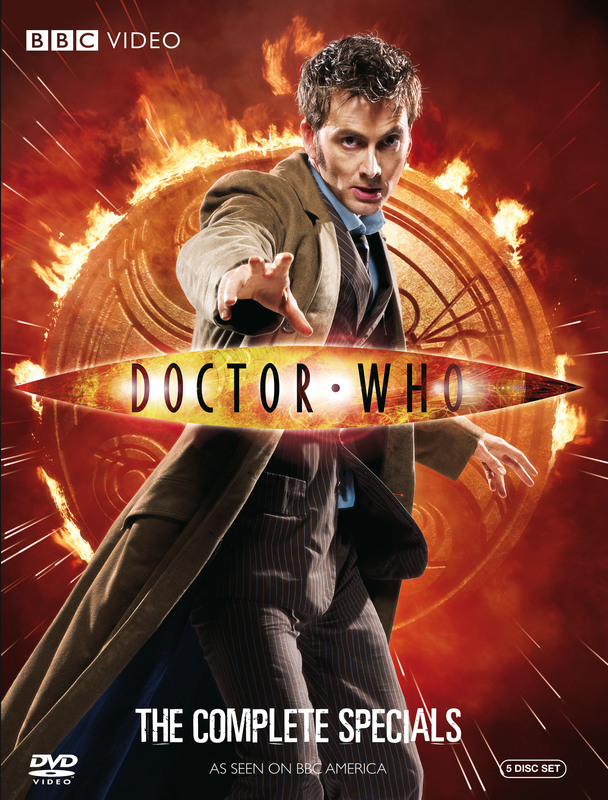 Like previous releases, the DVDs come in a cardboard slipcase with a reflective action shot in a striking fiery orange on the front – but this time it is the Doctor alone, with no “companion” due to his decision to forgo a proper companion after Donna, although there is some consideration to “one-off” companions helping him in each. Each disc is screen printed with one of those characters. The discs themselves are held in a cardboard “roll-up” folder with three plastic disc holders, two of which are the “stacked” holders that make it difficult to remove one without removing the overlapping disc. Around the outside of the folder are various images from the episodes, with the front bearing another image of the Doctor on an orange starburst background – but perhaps symbolically his back is turned to us, walking away. There is also a small episode guide included, with images from the episodes and descriptions, along with a few quotes. It also includes a forward by David Tennant, which is more of a story about him visiting himself when he was 8 years old, and trying to explain to the young Doctor Who fan that he himself would become the Doctor. It’s a fun little story. The first disc is for “The Next Doctor”, featuring a print of “The Doctor”/Jackson Lake (David Morrissey) on the disc. This is an interesting tale, especially as it came out after David Tennant made his announcement that he would be leaving the role, AND that Morrissey is often brought up when speculation about a new actor for the role takes place. 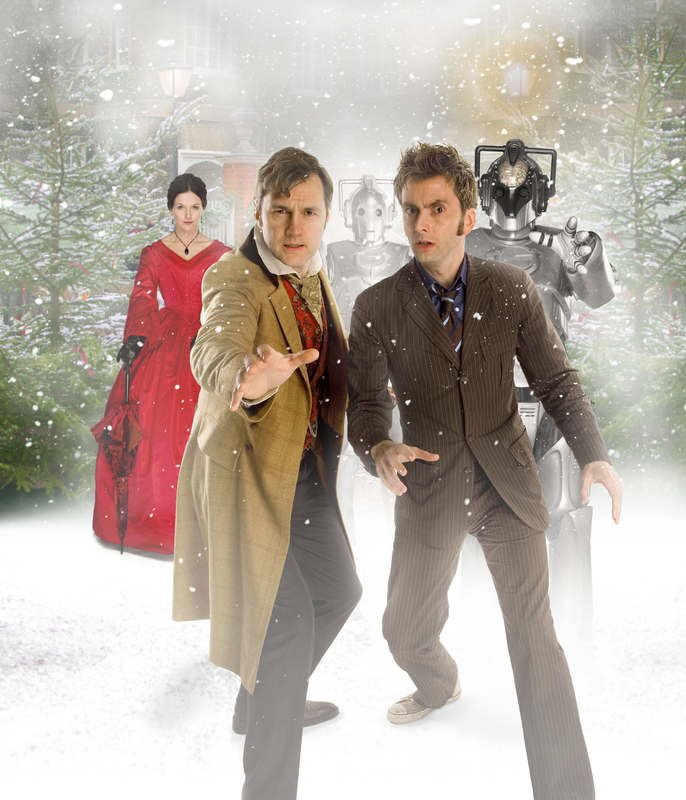 The Doctor, after having left Donna Noble and deciding to travel alone, arrives in London on Christmas Eve 1851, looking just to enjoy the time. But when a woman starts calling out his name, he realizes something is amiss. When he finds her, she seems puzzled at his assertion that he is the Doctor – and then another man arrives, claiming that he is the Doctor, and will use his sonic screwdriver…but this man neither recognizes the Doctor, nor the Doctor him. So the Doctor plays along in order to figure out just what is going on – which involves the Cybermen. This was a fun episode with a lot of in jokes and banter – the Doctor saying that he’ll be the “Doctor”‘s companion, etc. It also features something of a steampunk technology for the Cybermen, who escaped the Void to be trapped in the past without all the technology they needed so created it from the power sources that were available at the time. Morrissey shines in this role, and I could easily see him actually playing the Doctor, which until his origins are confirmed will leave you wondering if he really is. Dervla Kirwan is also devilish as Ms. Hartigan, with her red dress providing a stark contrast to the dreary, snowy setting. The Doctor also has a good scene explaining why he is traveling alone now. Also on this disc is “The Next Doctor Confidential” (55 minutes), which gets into the making of the episode and the characters and actors, and like all Confidential episodes is exceptionally produced. Plus as an added bonus you get the “Doctor Who At The Proms 2008” special from the Royal Albert Hall (59 minutes), with a symphony and chorus playing the music of and inspired by Doctor Who along with Cybermen, Judoon, Sontarans, Daleks, and even Davros making appearances, along with David Tennant in a mini-episode called “The Music Of The Spheres”. Lastly, this disc is unique in that it opens with a brief video segment of the Cybermen, with the menu representing one of their scanners from the episode. Disc 2 contains “Planet Of The Dead”, and features Lady Christina de Souza (Michelle Ryan) on the print. de Souza, apparently of aristocratic upbringing but living like a flirty super-thief, robs a museum and while fleeing the police boards a bus which also has the Doctor on board – and they find themselves and the rest of the passengers suddenly on a desert planet with no signs of life, and no certain way of getting back. I liked this episode better on a second showing. At first it felt like some random episode, with nothing really to move forward the Doctor’s story with one exception. If anything, it seemed to be setting up two possible things – de Souza as the next companion (and she would have made an AWESOME one – flirty but non-romantic, with practical skills and a questionable ethic), or a new series based on de Souza. Michelle Ryan is a great actress, having starred previously in Jekyll and the short-lived NBC revivial of Bionic Woman, and played this role well. Comedian/actor Lee Evans also did well as frazzled UNIT scientific advisor Malcolm Taylor, trying to work with the Doctor (who he idolizes) to bring the people back. But in the end, de Souza does not join him as a companion, but not because she didn’t want to – the Doctor refused her as he still did not want to become emotionally invested again. And I haven’t heard about any new series for Ryan either. Included on this disc is the Confidential special, “Desert Storm” (57 minutes), which gets into the location shooting in an actual desert (just how do you get a London double-decker into a desert? ), and closing a tunnel in Cardiff for two days. Disc 3 is for “The Waters Of Mars”, featuring Adelaide Brooke (Lindsay Duncan) on the print. “The Waters Of Mars” is a much darker episode, which follows the mood of the Doctor who is aware of the prophecy of his death. The Doctor arrives on Mars just to get away and wanders around, randomly encountering the humans of Bowie Base One who detain him. While he is being interrogated he in turn learns from them who they are, and the date – 21 November 2059 – and its not a good day for the Doctor to be there. The crew have uncovered a mysterious water-born life form in the ice (possibly have been trapped there in the past by the Ice Warriors) that is transforming any who come in contact with the water. And that is the day the base exploded and all hands were lost, and it is a “fixed point in time” that the Doctor cannot change. In general, this wasn’t much different for the most part than any of the other creepy, dark episodes, being similar to “The Impossible Planet/The Satan Pit”, with the exception of the Doctor’s attempts to avoid helping as he believes he is following the rules of Time. There is a discussion between the Doctor and Brooke as to why he can’t help, but that her descendants, having been inspired by her, would go on to do even greater things. As the crew attempts to escape, he leaves them to head back to his TARDIS, but listens to their communications as he does so. Finally, he turns back, and defiantly announces that if the Time Lords were the enforcers of the rules, and he is the last of the Time Lords, then he is no longer bound by those rules and has total authority – marking a major change in what the Doctor believes, and when he seems to succeed, it goes horribly wrong and he is left to deal with that – just as a vision of Sigma Ood appears before him to remind him of his fate. A number of emotions come into play in this episode. I think the cast did well, but there were a lot of them to absorb so none particularly stood out. There are some deleted scenes (available on disc 5) which fill in a bit more of some of the characters that had to be cut or altered for time, so what made it into the final cut would leave some viewers guessing as to what some of the relationships were – but Russell T. Davies admits that he likes it that way (which will become a bigger thing with the finale). We also aren’t told what the ultimate effect of the change that Doctor caused, if any, will have. Like Disc 2, the only extra on this disc is the Confidential special, “Is There Life On Mars?” (58 minutes). Since Discs 4 and 5 are for the two-part story “The End Of Time”, I’ll discuss the special features of these discs before moving on to the story. Disc 4 features Wilfred Mott (Bernard Cribbins) on the print. Aside from the Confidential special “Lords and Masters” (57 minutes), it also features the last of “David Tennant Video Diary” (41 minutes), where he brings his own camera along with him while filming his last episodes, and also some of the brief channel ident videos used by BBC One for the holidays – the longer of which was also used by BBC America. Disc 5 features, fittingly, David Tennant on the print. It includes another Confidential special, “Allons-y!” (57 minutes), which gets into the final days of filming, along with “Doctor Who At Comic-Con” (21 minutes) with them attending the 2009 convention, and several deleted scenes with explanation by Russell T. Davies (17 minutes). 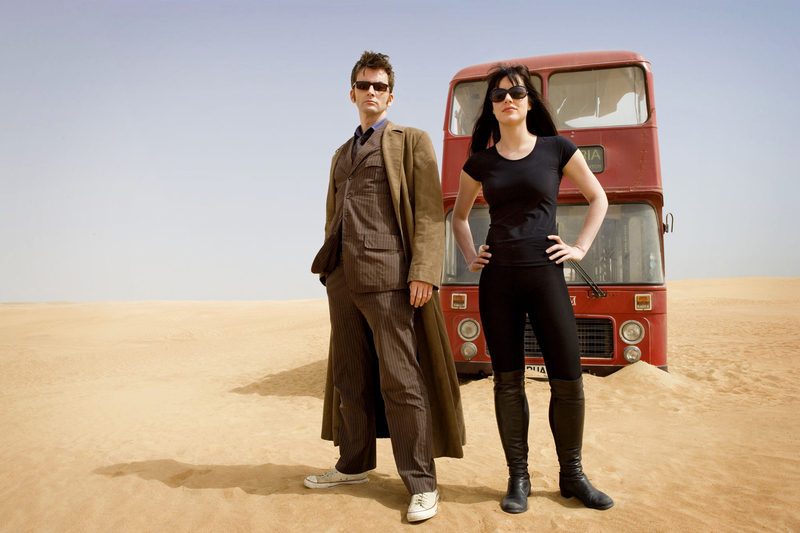 Both parts also feature full-length commentaries – the first with David Tennant, Catherine Tate and director Euros Lyn, and the second with Tennant, Lyn and John Simm. In “The End Of Time”, The Doctor meets up with the Elders of the Ood, who share with him a vision of what is to come – notably the return of the Master and the end of Time itself. SPOILERS ALERT: If you still haven’t seen this, skip to the “END SPOILERS HERE” near the bottom. Since this is the most recent to be aired, and perhaps the most spoilable, I’m calling it out again. This may be one of the best productions so far. Its an emotional rollercoaster ride, especially at the end. The insanity (which we learn the cause of) of the Master is really brought out by a great performance by John Simm. Cribbins, given a more expanded role here over his previous supporting appearances, fills it out wonderfully, raising the emotional bar. A little comic relief is added by the aliens Addams and Rossiter, but just enough. And who else could be the Lord President of the Time Lords than Timothy Dalton! I though the Naismiths were a little over the top…there isn’t much certainty to me as to who they were (other than wealthy and powerful). And Catherine Tate’s appearance as Donna Noble was more cameo-ish – it would have been good to see here take part instead of being a background character for the most part – although several of the Doctor’s previous companions also have cameos at the end. There were a number of questions left by the episode – several of which we will be unlikely to ever get resolved (as said, Davies likes it that way.) Who was the Time Lord woman who appeared several times to Wilfred? She is obviously of some importance to the Doctor, but it is never said on screen. There is lots of supposition on the Internet based on what she said when Wilfred asked her who she was, some focusing on it being Romana, or possibly the Rani, but my first inkling was that it was the Doctor’s mother (even though familial relationships of the Time Lords have never really been discussed), and apparently that was Davies’ intent according to his statements, but since it wasn’t done on screen it is left open to discussion. Also, the Doctor identifies the Lord President as Rassilon – but is that the legendary founder of the Time Lord society (perhaps woken from his immortal sleep to help lead the Time Lords again, but turned insane), or just another Time Lord with the name? That is never addressed either. The only production “issue” I had was with the scene of the Lord President addressing the Time Lords – the scene just looked too much like the Senate scenes in the Star Wars prequels – the floating platform with the Lord President, the platforms on the surrounding walls, etc. And I did snicker a bit when they arrived on the Vinvocci ship in orbit, and immediately thought “Starbug” from Red Dwarf. Even if you’ve already watched the episodes, recorded them, or (gasp) downloaded them, the extras on these DVDs alone are worth having – but especially with the top of the line episodes of “The Next Doctor” and “The End Of Time”, and if you are a fan of David Tennant, these discs are a MUST HAVE. It is a sad farewell to say goodbye to the 10th Doctor…more so than with the 9th who we enjoyed a lot but perhaps didn’t get to know as well because he wasn’t around as long. And I predict a bumpy road ahead for the 11th Doctor to gain acceptance among the fans – but certainly a road that can be taken successfully.